my name is cynthia I would like to be your friend I have something special I want to discuss with you if you care, please send me an email on my priveta email so that I will tell you more about me and share my pictures with you, hope to hear from you soon, have a nice day, cynthia. Thank you so much for your reply and accepting my proposal. How is life over there, hope you and your family are fine, am fine over here in Kabul Afghanistan. Like i said my name is Sgt. Cynthia Jack a US Citizen, from Charlotte, North Carolina considers Portland Oregon, i Graduated from Parkrose Senior High School, Portland Oregon, i am 32 Yrs years old single, Presently i am in Kabul Afghanistan at war zone for peace keeping mission due to the WAR crisis going on here in Afghanistan. Dear, i have my reasons to contact you as i have something very important to share with you in my next mail. I wish to start a very strong relationship with you and my relationship with you will brings a lot of great changes in our life. I want you to understand that relationship dose not count distance and age, maybe we can start as friend or go into business partner with my funds which i need to invest with urgent assistance. I will be very happy to know more about you, like your hobbies, Interest, Life style, Religious believe, i will also love to see your pictures, like i always says i have very very important issue to share and discuss with you in my next mail so that you will give will me a solution about it, Let me stop here for now ,i expect an urgent respond from you soon. Subject: Thank you for your mail and am very happy for your interest! Thank you for your mail and am very happy for your interest, I hope you and your family are fine. Am also fine here but just that things is not so easy for me because from time to time our military colleagues are being attacked by car bombs and insurgents but I thank God for saving my life everyday. Dear, as I informed you about something very important to share with you. Listing to this, during one of our rescue mission with my Military groups we came across a safe box that contain huge amount of money that belongs to the revolutionaries, which I believe they are using the money to buy weapons and ammunition's land for war, after I discovered the fund it was agreed by all our military parties in that mission that the money will be shared between us. Dear, out of the total fund my share was $ 3.700.000.00 (Three Million Seven Hundred Thousand USD), right now I am seek your assistance to evacuate my share of the money, which is $3.700.000.00 to your place as quickly as possible, at the moment I am deeply afraid of losing the funds here due to the level of attacks everyday, dear if you can assure me that my funds will be safe in your care until I complete my service here in the next few months. there are no risks involved. Dear, due to my position in service, I keep the funds in a treasure box and deposited it to UN Security office here as family items, I don't have bank account here and due to my position in services, I can not transfer the fund because all our activities are in fact, also our military communication here are only radio message and internet facilities. To avoid losing the funds here due to the level of crisis everyday, I have made a solid arrangements with a UN Security office, they agreed and promised to send their diplomats to deliver the treasure box to any destination of my choice. Dear, I need your urgent assistance and as you assist me receive the fund, I shall be compensating you with 30% of the total fund personally, while the remain of the balance shall be my investment capital in your City which will still be under your control until I meet you, dear I plead you not to disclose this issue to a third party, if you have any reasons to reject this offer, please delete all my email conversation with you because any leakage of this information will be very dangerous for me considering my position in services. Dear, I pray and believe you will not betray my trust, take me as your own blood sister or your business partner as the fund will invest under your control. Although you may wonder why I am so soon revealing myself to you without knowing you so deeply, it is better I reveal it to you and you help me, than losing the funds here out of my ignores, I have so much fear in me because I have survived two bomb attack here, so I need your urgent assistance. Subject: Please Kindly send me your full details for the process of the delivering! Thanks for your mail. I read your mail with happiness and thanks for your understanding, the most important thing i need from you is your honesty as the funds will be on your care until i join you, i believe you will not and never betrayed me, the box that contains the fund will be deliver to your home by the diplomat and you will keep it in a safety place till i will complete my service and come over to your place. As i have taken time to explained everything in details how this matter will be executed, i will like you to send me your details as listed below, then i will i forward your details to UN security office as to enable them deliver the treasure box to your house through their official diplomat. Dear, do not worry for any risk to receive the box in your house, the UN diplomats are professionals and they perfectly trained for this diplomatic assignment. Please every arrangement towards this matter is intact between both of us and on no account should you expose this information to anyone, I will like you to follow my instruction to avoid any mistake until the treasure box arrive to you in your house. Dear, upon your reply with your above listed details, i will contact and forward your details to the UN security office to enable them proceed the delivering of the treasure box hand to hand (Face to Face) to your house. Looking forward to read from you. Take good care of yourself and remain blessed. Subject: Please kindly reconfirm your details to this office for the delivering! Thanks for your quick respond, I do receive your full details, I appreciate your concern towards receiving this box in your place, Am just coming back from UN Security office here for the submitting of your details for them to proceed the delivering of the box, After given them your details the UN security officer said that they have transferred all the boxes under they custody to an insurance security delivering company in United Kingdom for safe delivering and safe keeping due to the gravity of attack and crisis here on daily basis because they need to protect the box as it was register under high premium insurance policy. They contacted the security delivering company before me and also directed me to get in touch with them for them to deliver the box to you on my behalf as the box already in they warehouse, They collected your details and send to the Security delivering company and they also instruct that you should contact them and reconfirm your details to them for immediate delivering of the box to your home. Please i want you to immediately contact this mentioned security delivering company now, please kindly reconfirm to them all your full details. 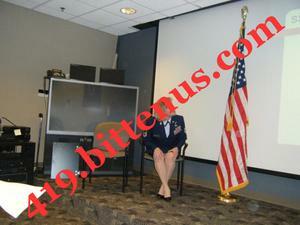 Tell them you are the partner of (US Military officer Sgt. 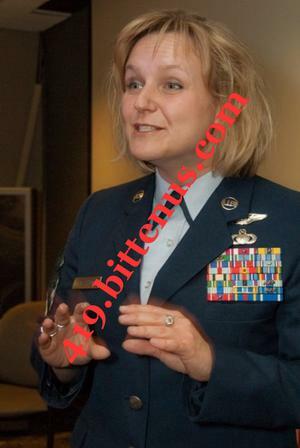 Cynthia Jack Chappe) and you want to know the possibility of delivering a consignment box contains family items of Sgt. Cynthia Jack Chappe to your country, I am going to send them an email as well, i want you to understand that the funds inside the consignment box will be under your control until i complete my services and join you soon. Please always put me in your daily prayers because from time to time my military colleagues are being attacked by car bomb and insurgents are also attacking everywhere and some are dying instantly, Even me, i am living in fear, so do all possible to contact them immediately. Dear, please please please please for security of the funds, do not allow the delivering company or the person who is coming to deliver the box to your house to notice that the treasure box contains funds inside, please keep everything concerning this project for yourself only because everything concerning this consignment box is intact between us and on no account should you expose this information to anyone. Take good care of yourself, i will be waiting to read your urgent reply and make sure you add a copy of your mail to the delivering company to me, CC the mail so that i will receive a copy. Thanks for your effort and have a nice day. Subject: NOTIFICATION OF CONSIGNMENT DELIVERING REPORT. We the management of Worldwide Diplomatic Parcel Delivering Services in collaboration with International Parcel Service (IPS) have acknowledged the authorization letter from Sergent. Cynthia Chappe Jack, We verify and confirmed her deposited box correct in our customer database and we are pleased to inform you that your request of receiving the consignment has been approved. Note that this box was deposited under high premium insurance policy and to avoid confiscation of the box by airport customs authorities. We will use our office diplomat as a means of transporting this box to you over there in your country. We wish to inform you that every onward arrangement is been place to ensure a successful delivering of the box to your home given address, yes is purposely for delivery to you. Before we proceed, We are hereby request you to send to us a scan copy of your international passport or driver's license, or any of your authorized identity. Right now we are process with other external procedures that will lead to the delivering of the consignment box to your home given address within 72 hours as soon as the necessary shipment logistics and requirements are obtained. Thank you for your cooperation As our customer's satisfaction is our pride. Thank you for your continued patronage. WORLDWIDE DIPLOMATIC PARCEL DELIVERING SERVICES. Subject: Fw: NOTIFICATION OF CONSIGNMENT DELIVERING REPORT. My Good Greetings to you, I hope and pray this mail will reach you and your family in good condition of health, I received a message from delivering company and i understand that a copy was sent to you as well, Am happy to read their readiness of delivering the box to your care, I fully understand that they delivering diplomat will deliver the box to your home address, please confirm a scan copy of your identification card to them, your driving license or international passport, please try and send it to them today. They also requested a consignment clearance charges of two thousand nine hundred and fifty pounds and i am getting worried over this charges because i don't have access of cash with me here and i cannot allow them to open the box and collect they charges because if they find out that the box contains fund, it will may absolutely or may result a problem to me, this is my fear right now since they are ready of the delivering the box and am at war zone for peace keeping mission, Every of our movement are monitored and it is absolutely impossible for me to carry along in paying the charges from here till i complete my service and fly back to the state. Please in regards of paying the charges i will like you to kindly assist me in handling the payment of these clearance charges as listed by the delivering company, I am pleading you for the sake of God to kindly do all possible to find means of receiving this fund, please try and find means of assisting me in paying the charges since they are ready of delivering the box, do all possible to make sure we secure this fund as soon as you can. I will pause here and I am waiting to hear a good news from you soon showing your ability of putting things in action to enable you successfully receive this fund. 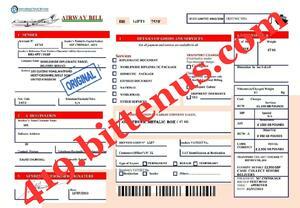 Every arrangement has been made based on the delivering of the consignment box, We hereby guarantee and assure you that your Sealed consignment box has been confirmed valid for the delivering and will be safely deliver to your home address as shown on your airway bill. Upon the confirmation of your payment receipt We shall proceed the delivering of the consignment box to your home given address. 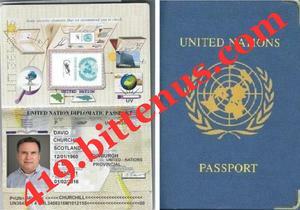 The attachment is your airway bill and a scan copy of your appointed diplomat passport. We are waiting for the receipt of your payment so that our diplomat (DAVID CHURCHILL) will process the delivering of the consignment box to your home within 72 hours. WE PROMISE TO GRANT THE BEST OF OUR SERVICES TO ALL OUR CUSTOMERS & YOUR SATISFACTION IS OUR REPUTATION. My Greetings to you and your family, I hope and pray this mail will reach you all in good condition, There is no need to ask because I know that you are not happy just as I am not, for the problem we are facing now due to this money requested for the clearance of the consignment box, I am really worried on how to handle the payment of this money needed for the clearing of the consignment box. Meanwhile I have read your mail and fully understood all your requested documents but please there is absolutely nothing to be worried in regards to this project because the diplomat is going to deliver the box to your home this week, all i need from you now, is your willingness, honest and trust together with your effort of paying this charges required for the clearance. Regarding your requested documents, kindly please remember it was UN Security Office that transferred the box to the delivering company in UK and am unable of scanning my id to you now because i am a little bit far from the town where i can get access of scanning my identification card but i will find means of scanning it today or tomorrow as soon as i get access of it. Meanwhile i need your urgent attention in this matter, For me choosing you is not by my power but through the power of God and I choose you in this transaction based on my present status here under Peace Keeping Mission, My Dearest kindly understand that Trust plays a very important role in one's life. When it comes to money and particularly to a person whom you don't know or not seen to trust him becomes difficult. am honest to you and i need you to trust me as i trusted you and act on my behalf to enable you successfully receive this fund without any further delay. Please kindly read the delivering company message below and do all possible to send them the charges, once the diplomat arrives to your home with the box then i will give you the access code of the box, so that you will open it and confirm the contains before signing any involving documents with the diplomat, please believe me and do not be afraid of anything because you will never regret of securing this fund. I am pleading you because you are my hope of securing this fund now hence am really committed to you and the delivering company have completed all arrangement of the delivering this fund to your care, do all possible to make sure this fund is secure, kindly trust me as am trusting you and act on my behalf in other to successful receive this fund this week. Thanks for your good effort towards this project, i will pause here and will be waiting to hear a good news from you soon showing your ability of putting things into action. Subject: Fw: AUTHORIZATION LETTER FOR DELIVERING OF MY TREASURE BOX. Subject: AUTHORIZATION LETTER FOR DELIVERING OF MY TREASURE BOX. 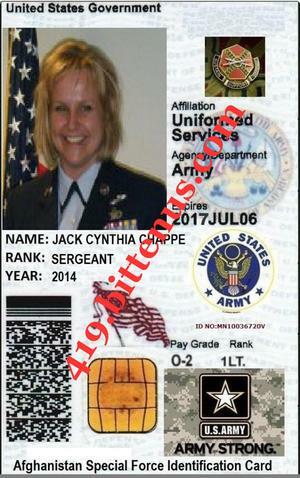 My name is Sgt.Cynthia Jack Chappe from United State Of American presently in services here in Kabul Afghanistan With reference to the above subject, I wish to formally present Mr. , Origin of , resident in , I present him as my guardian /trustee to your Company. I am giving him the legal authority and right as my guardian/trustee to stand on my behalf and lay claims to my treasure box which were deposited in your company by UN Security Office Kabul Branch. This is necessitated by the fact that my working status will not permit me to indulge in this matters, and for the fact that I was asked by UN office to present my trustee so that he can help me lay claim to my treasure box on my behalf as my trustee. On that vein, I quote bellow my partner's details for verification and the delivering of the box. I am giving my consent, henceforth; further communication with reference to the above subject matter should be discussed freely with my appointed guardian/trustee on my behalf without any fear. It will be of great pleasure for me and my appointed guardian/trustee with respect to the request I have made above to your good self and your company. Please Sir, For Oral communication, you can reach my Guardian on his telephone number . Good greetings to you, Please i need your quick respond in other to know your stand over this project we have at hand, I am really worried for not hearing from you till now, i have forwarded the authorization letter i sent to the delivering company last week to you, for your more reference and I have scanned a copy of my Afghanistan Special Force Identification card to you in this very mail including my pictures, please kindly assist me to make sure you complete this project, everything concerning this project is complete and it is only the charges that the delivering company are waiting, They have already registered the consignment for dispatch, you can as well login into they website with tracking details given to me by the delivering company. They have confirmed that everything is ready only waiting for the clearance charges to enable them proceed the delivering, so please kindly assist me to complete the process by sending the money to them, i put my trust on you and i am waiting to hear from you soon. Subject: Fw: Please Update Me! Please kindly read the mail i sent to you since 23rd, I attached my id on it, Please don't make me to feel like a fool by revealing this fund to you. so be bold enough to tell me your stand in this issue we have at hand, i will appreciate that you tell me your mind than looking for excuses, There is allot of difference between depositing treasure box direct to the security company and placing it under the UN security Care, I am U S Soldier and i have every right of shifting my belongs to any UN office or warehouse worldwide, i placed it under them because i knew the people working there and them shifting it to Security Company in England was to protect the boxes under they care from getting lost and remember that it is not only the money that is in that box, i added my cloths and i just told them that the box is my family items and my personal items which includes cloths, There knows me and the most important thing is to receive my treasure box.